"BigQuery has massively streamlined our ability to provision analytics across data science and product teams. In terms of query speed and scope, BigQuery is significantly better than other platforms I've used in the past,” says Dimitri Masin, Monzo’s Head of Data. “We're pleased to see BigQuery's regional availability in London and the expanded options it offers customers." BigQuery’s rapidly growing partner ecosystem already supports BigQuery’s regional availability, and this includes visualization partners like Tableau, Looker, Qlik, and ChartIO, as well as data ingestion solutions such as Striim, Treasure Data and Embulk. 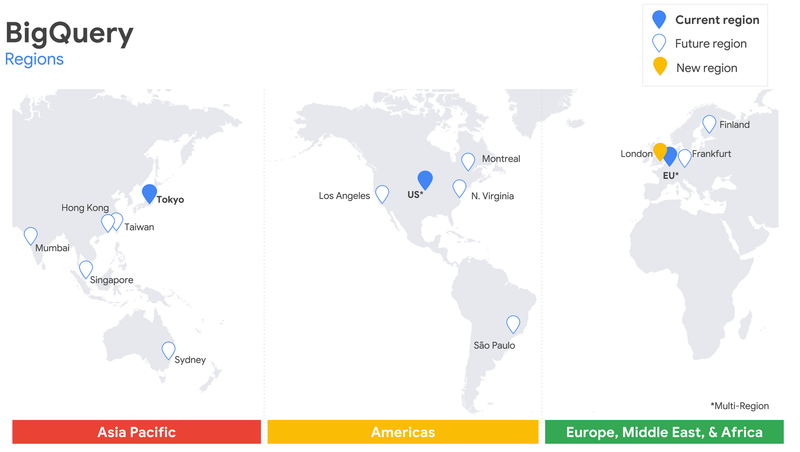 BigQuery regional availability is also supported by other Google Cloud products like Dataflow and Dataproc. Additionally, the BigQuery JDBC/ODBC drivers have been updated so that customers who use BigQuery via any driver-based tool can use BigQuery in-region.